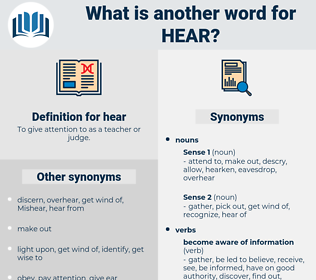 What is another word for hear? To give attention to as a teacher or judge. hang on someone's every word. by the sound of it/things. gotten in to ones head. witnessed, are, AM, Learnt, Knew, tell, Told, gather, teach, speak, spoke, receive, appear, feel, intend. Learnt, heed, entertain, adjudicate, tell, Told, gather, teach, speak, receive, consult, prosecute, collect, appear, educate, hearthe, feel, intend, perceive. I hear that he is back. get, overhear, catch, take in.